Blends nutritious and supportive herbs with stimulating herbs, producing a balanced, uplifting tea that energizes without the side-effects of caffeine. 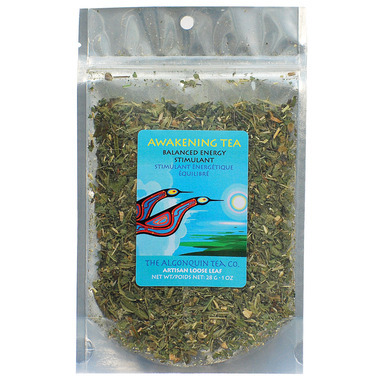 Awakening tea is ideal for when we want a boost to keep up running, dancing, playing working, and get going any time of day! LABRADOR TEA – stomach ache, fever, bronchial ailments, liver-blood tonic. MOUNTAIN MINT – headaches, colds and fever, indigestion. ALFALFA – synergistic and nutritive high in vitamins and minerals. NETTLE – kidney blood tonic, spleen, circulation, rheumatism. ASTRAGALUS – stimulant, tonic for spleen, kidneys, lungs. ANGELICA – colds, flatulence, appetizer, stimulant. JOE-PYE – rheumatism, gall bladder urinary tract, impotence. CALAMUS – stomach, fevers, colds, coughs, stimulant. GINSENG – blood circulation, mental stimulant, adaptogenic. Y'all. This tea is so good. It's minty without being in-your-face wintery, you know? Instead it's more fresh, like a walk in the garden. It's supposed to be a stimulant, and it is, but it's fairly gentle. They don't say it, and maybe they aren't allowed to, but what a lot of the ingredients are great if you're prone to low iron.